I never met Johnny. I only recently met his surviving partner, Eric. To my Two Cowboys, who made writing this not only possible, but necessary. Written By Eric, Jonny's surviving partner. Johnny D, a Washington, DC-area resident since 1983, died on February 19, 1999 of complications due to AIDS. He was 54 years old. Born in Knoxville, Tennessee and raised in several East Tennessee communities, Johnny joined the US Navy after graduating from high school in Knoxville. He served on the USS Cone and was stationed in the Mediterranean. He traveled widely throughout Europe and South Asia during his service. After discharge, Johnny returned to Knoxville, where he studied business management at the Cooper Institute of Business. Through the 1960s and 1970s he owned and managed several pet wholesale and retail businesses before coming to the Washington area. In the Washington area, he worked most recently at Rags to Riches, an Alexandria pet grooming shop that he managed until he retired for health reasons in 1997. Johnny was devoted to the breeding, care and grooming of animals, both professionally and as his avocation. He was an avid horseman and a member of the Atlantic States Gay Rodeo Association. 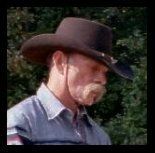 He was a rodeo enthusiast and was a certified rodeo judge for the International Gay Rodeo Association. He lived on a farm in Aquasco, MD with his lifetime companion, Eric, where the two raised horses and ducks, as well as their pet dogs and cat. He enjoyed gardening and caring for his orchid collection. "Johnny was a person of very strong determination. Once he'd made up his mind, he would stop at nothing to carry out his will. He was devoted to his friends, and he considered all beings to be his friends, once a bond had been established. He had a sly sense of humor and was always able to find a way to help others feel at ease with a joke. He cared very deeply about their wellbeing and expressed his care by hands-on treatment and love," said Eric. Jonny was deeply spiritual and continued to seek after the tradition of his grandfather, a Native American from the Smokey Mountains. In addition to his partner, Johnny was survived by his stepmother, Helen, his sister, Tona, his brothers, Chuck and Buddy, all of Morristown, Tennessee, his nephew, Jason, of Bean Station, Tennessee, and his daughter, Lisa, of Sykesville, Maryland. He was predeceased by his father Ulys J. His remains were cremated and scattered near his grandparents' burial site at Gatlinburg, TN.